Home > Doing Business and Central Asia – After 15 years, how much reform? 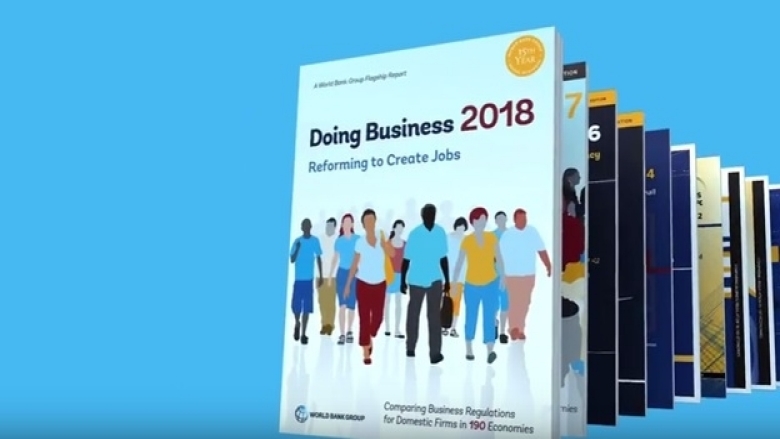 This year, the annual Doing Business  Report – by far the most anticipated and cited World Bank publication – celebrates its 15th year. Starting in 2003, the fledgling report, which then covered about 130 countries, has grown into its teens garnering admiration and criticism in equal measure. Some absolutely love it, while others argue that its flaws outweigh its strong points. The four Central Asian countries covered by Doing Business  have embraced the report and its global appeal. In the late 2000s, the Central Asian governments of Kazakhstan, the Kyrgyz Republic and Tajikistan all approached the World Bank Investment Climate Department, where I was based at the time, with requests for support on Doing Business reforms. Those were indeed the heady days for Doing Business enthusiasts. Georgia had implemented reforms and demonstrated that even poor post-Soviet countries could leap up in the rankings and become recognized as successful reformers. Others soon followed suit. Presidents of countries started paying attention to their countries’ Doing Business rankings. Our small unit could barely cope with the number of requests to launch reform programs and write our diagnostic memos and prescriptions for reform. Kazakhstan and Tajikistan were among many other countries across the globe that I visited during that period to launch reform programs. I felt like a Doing Business “doctor”, diagnosing the problem and offering the solution. We eventually had to expand our small team to be able to help all the countries that suddenly “woke up” to the need for business regulation reform. I was fortunate enough to be the Doing Business Reform Unit team-member that launched the Kazakhstan reform program in December 2008 in Astana, in the presence of then Prime Minister Karim Massimov, the entire Government, and the IFI (international finance institutes) community. At the time, we partnered with USAID to derive the maximum results – they had already started a business environment reform program across Kazakhstan, the Kyrgyz Republic and Tajikistan, and had a strong team of local consultants in place. Perhaps more than in any other region, Doing Business holds a strong spell over Central Asia. The report is closely monitored, the scores and rankings are debated among policymakers, and each annual launch unleashes both fervent enthusiasm for new reforms and a passionate wave of complaint, directed at both the team in Washington and us on the ground. Some of the governments went further and hired successful foreigners to guide them in their reform efforts - such as Kazakhstan. Kazakhstan also launched its first very successful Subnational Doing Business report earlier this year, and has requested World Bank support to expand the Subnational Doing Business to cover the whole territory of the country. In fact, Kazakhstan is also developing its own Doing Business-style index, and implementing it. Uzbekistan has recently drafted a decree to clarify how Doing Business reforms will be pursued and who will be responsible. All four of the Central Asian countries have national committees that oversee the reforms and, at least once a year, they send senior officials to World Bank Headquarters to make the case with the Doing Business team. But the big question is: has it all been worth it? Did all this drive for reform materialize into real, deep and meaningful reforms, or, as some Doing Business detractors like to say, has it been just a cosmetic tinkering with laws and regulations, with no real value to real people and entrepreneurs in the street? Well, the answer is: it depends. There is no doubt that some of the reforms – such as single-window business registration centers and online platforms for business registration, construction permits, property registration, and filing and payment of taxes – have benefited everyone. But it is also abundantly clear that some reforms – such as amendments to laws on minority shareholder protection or getting credit – have done little to curb poor corporate governance practices or to expand credit in a meaningful way, especially when the banking systems have been ailing for a while. Despite scoring quite low in Doing Business across Central Asia, cross-border trade has seen very little reform. And, areas such as insolvency and enforcing contracts leave a lot to be desired. In other words, nearly 10 years of Doing Business activism across Central Asia have produced a mixed bag of results. In my view, the way forward needs to focus less on scores and rankings, and more on the implementation gap. For that, the Governments of Central Asia need to really engage the private sector. And the private sector also needs time to absorb and learn about business regulatory reforms. Uzbekistan is already doing it – by making the newly-revamped Chamber of Industry and Commerce lead a lot of the operational work on Doing Business. Others should follow their example. In addition, citizens should be better informed about all that is being done - since they are the ultimate beneficiaries of the reforms. And, finally, reforms need to be continuous and constantly nurtured. This requires an ongoing, multi-year, consistent action. And implementation.